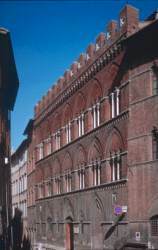 The Pinacoteca Nazionale in Siena is located in the 14th century Palazzo Buonsignori. It contains an extensive collection of 13th-16th century Sienese paintings arranged on two floors. The collection was started by the Abbot Giuseppe Ciaccheri towards the end of the 18th century and has grown ever since through bequests and donations. The Italian State assumed ownership of the collection in 1930 and it was definitively installed in Palazzo Buonsignori two years later. Since 1977 the collection has also included the Spannocchi Collection, made up chiefly of northern and Flemish masters such as Dürer. In 1977 the Pinacoteca opened its Sala delle Sculture sculpture gallery, which includes works by Senese masters from the 14th and 15th centuries. You can find more information on the Pinacoteca Nazionale at its home page.